We generally would not acknowledge the negative blog site Winfield 411, but there have been some recent developments worth noting. The first is that finally there is someone who will now take credit for owning or at least managing the site and that is current Village of Winfield Trustee Tim Allen. Anyone who may have any issues with items that are posted there can take that up with him. Congratulations Mr. Allen, you now have complete control of your beloved website. 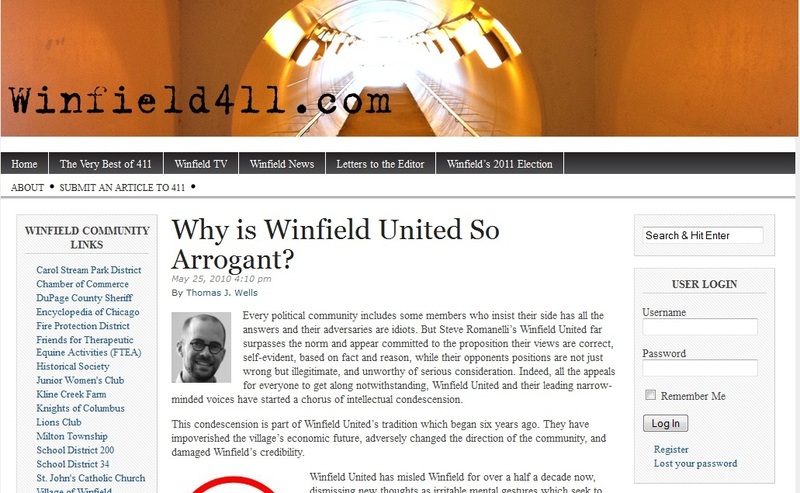 Second and of noteworthy comment is that Winfield United sources have uncovered that one of the “anonymous” authors who identified himself as Thomas J. Wells and posted a picture of himself was actually illegally using a picture of another author, Josh Harkinson, who writes for a liberal news source called Mother Jones. Mr. Harkinson has been contacted and made aware of the misuse of his identity. Those posts have since been removed from the 411 website. The other pictures being illegally used for Tammy Collins, K. Lambert and a host of others remain in place along with their stories. Josh Harkinson is a staff reporter based in San Francisco for Mother Jones magazine. This is his official profile on the Mother Jones website. The website has been a farce since its inception as an information site, supposedly where residents of Winfield could openly discuss issues. Unfortunately, as more details are surfacing, the posts and stories have been nothing more than fabrications; many illegally using copyrighted photographs of others in an effort to give credibility where none was deserved. Mr. Allen has now instituted a block on anonymous articles, while still allowing anyone to post their false attack comments anonymously. His intentions it would seem, are to foster good discussions on areas of interest, namely his own. Winfield United has always supported open and honest government and we always encourage people to get involved to help our village prosper. We do not support anonymous and false attacks on any resident, and would hope that the new ownership of the website and those who choose to post comments will demand a higher standard of accountability from the participants. Good ideas can be generated when people can openly share their opinions. Those who are disrespectful and malicious while hiding behind a fake screen name do not foster the type of behavior that promotes healthy discussion and solutions to issues. Let’s hope that people who post on blogs remember what Winfield is best known for, friendly people willing to help each other.